Activists from the Lift the Ban Coalition protest at the James R. Thompson Center downtown on January 31. On March 20, a resounding 77 percent of voters in 77 precincts scattered across Chicago said yes to this question—or to a variation of it that appeared on some primary election ballots. The vote on the referendum included Fifth Ward precincts 11 and 18, both located in Hyde Park. Together, the two precincts occupy the strip of land between South Lake Park Avenue and South Hyde Park Boulevard, bordered on the north and south by East Hyde Park Boulevard and East 55th Street. Hyde Park support for the referendum mirrors broader trends in Chicago, with 83 percent of voters in precinct 11 and 77 percent in precinct 18 voting affirmatively. The measure also appeared on ballots in five other precincts in and around Kenwood, where it met similar rates of approval. Despite the apparent citywide consensus, the future of rent control in Illinois is murky. The referendum is non-binding, so it has no direct impact on the three bills that would repeal the ban currently pending in the state legislature: a House bill introduced in February 2017 by State Representative Will Guzzardi (D-39), a parallel Senate bill introduced this January by State Senator (and recently defeated Democratic primary gubernatorial candidate) Daniel Biss (D-9), and a more comprehensive and controversial Senate bill proposed in February by State Senator Mattie Hunter (D-3), the majority caucus whip. CECD and 20 other organizations affiliated with the Lift the Ban Coalition are chiefly responsible for pushing the referendum onto ballots. Led by four groups—the Kenwood Oakland Community Organization (KOCO), the Lugenia Burns Hope Center, Northside Action for Justice, and Pilsen Alliance—the Coalition has canvassed neighborhoods for nearly two years urging a repeal of the 1997 Rent Control Preemption Act, which banned municipal rent control policies across Illinois. Guzzardi’s bill, which simply repeals the Act, was introduced in February 2017. Over a year later, it has gained eight cosponsors but still languishes in the Rules Committee. Guzzardi told the South Side Weekly in February that while he feels confident in the possibility of a hearing on the bill this spring, he does not expect the bill to make significant legislative strides in 2018. The issue did gain political traction during the gubernatorial primary race, however. In January, Biss introduced his Senate bill, which simply reproduces the text of Guzzardi’s bill and calls for the ban’s repeal. Businessman J.B. Pritzker, since elected the Democratic nominee, also voiced support for a repeal. “We’re taking the results of the referendum, which we find are very representative of the city of Chicago’s diversity, ethnically and by income level, [to be] very encouraging,” Jawanza Malone, executive director of KOCO and one of the key figures in the Coalition, told The Maroon over the phone. He added that Coalition members are currently meeting with Guzzardi, Biss, and Hunter to discuss possibilities for a rent control act, and noted that “a cadre of senators” support some version of the initiative. Activists and legislators have yet to agree on what the act should look like. The bill also awards two income tax credits to property owners who rent to households within a county’s specified income level: one equal to the difference between the rent-controlled amount and the county’s average rent, and one equal to any capital improvements made on properties rented to households within the specified income bracket. Though they are still “workshopping” Hunter’s bill, the Lift the Ban Coalition aims to steer legislators toward it rather than toward Biss’s bill, because they see it as better equipped to protect low-income Chicagoans in gentrifying neighborhoods, said second-year AK Alilonu. Alilonu is a member of the UChicago chapter of Common Cause Illinois, which bills itself as a “nonprofit watchdog group” promoting “open, ethical, and accountable government.” He facilitated the student group’s involvement with the Coalition—which has included helping to stage a January 31 protest at the James R. Thompson Center downtown aimed at pressuring Governor Bruce Rauner into supporting rent control. 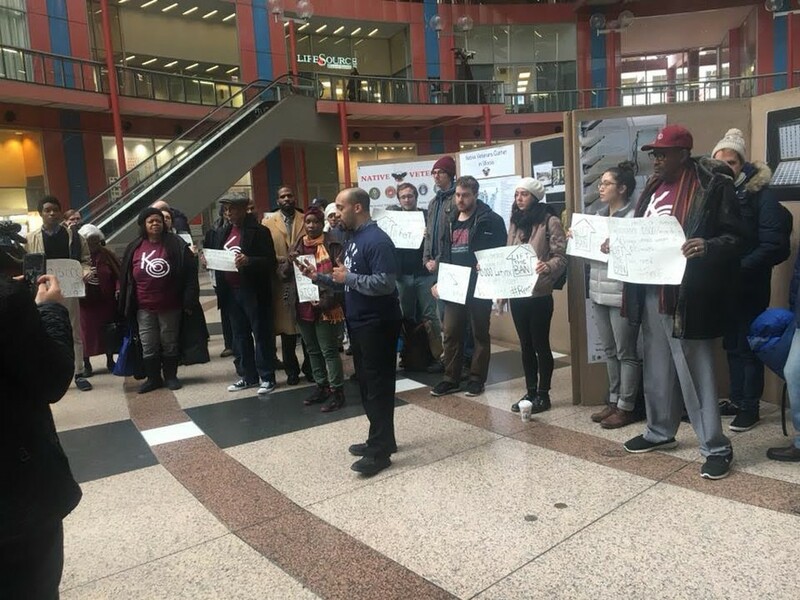 Alilonu noted that unlike many of the groups in the Coalition, UChicago Common Cause favors Hunter’s bill only as one mechanism for repealing the ban and granting municipalities the freedom to set housing policy. As the primary liaison between the Coalition and Springfield legislators, Malone is still mired in negotiations on Hunter’s bill. He said one issue he sees with a statewide framework for rent control is that it should not be restricted merely to low-income groups, as is suggested by the current provisions for Rent Control Boards outlined in Hunter’s bill. According to a 2017 study by the Institute for Housing Studies at DePaul, 51 percent of renting households in Chicago are cost-burdened, meaning they must allocate more than 30 percent of their income for rent. Due to skyrocketing housing costs, this includes even households with incomes above $150,000, since 60 percent of Chicago residents are renters, Malone said. Specific rent control policy proposals for Chicago pose another set of unanswered questions. For activists they are largely uncharted territory, to be discussed once a repeal passes. “Having this repeal prevents us from moving forward,” Malone said, adding that the Coalition has yet to solidify a full stance on local rent control policy. Five University students at the Paul Douglas Institute, a student-run think tank housed within the UChicago Democracy Initiative and partnered with UChicago Common Cause, are currently working on a report modeling the effects of various forms of rent control in Chicago neighborhoods, to be presented to Guzzardi upon completion. The students previously drafted another report on rent control policy for the Lift the Ban Coalition in February. According to fourth-year Pablo Balsinde, the students’ report will attempt to compare renters’ overall savings, rates of renter displacement, and any decreases in capital investment between types of rent control that could be implemented. These include the traditional system of caps on percentage increases on rent exceeding the Consumer Price Index, as well as what Balsinde termed more “innovative” methods, like increased taxes for landlords on the marginal revenue from raised rents. In Hyde Park, Woodlawn, and nearby neighborhoods, rent control will inevitably be bound up with University and Obama Presidential Center developments, should it be implemented. Wilcoxen discussed CECD’s nascent efforts to encourage local rental real estate agents to designate three- and four-bedroom apartments across Hyde Park to low-income families who are subsidized by Chicago Housing Authority vouchers—and who could potentially become eligible for rent control in the future. She described the initiative as a way to address likely vacancies over the next few years in currently student-occupied buildings as a result of Woodlawn Commons, the University’s new dormitory on 61st Street and Woodlawn Avenue slated to open in 2020. Malone, meanwhile, tethered the Lift the Ban Coalition’s work to KOCO’s activism for a community benefits agreement with the Obama Foundation, citing recently protested rent increases in an apartment building across from the Center as one example of the pressing local need for rent control. “There is a line between making a living and making a killing,” he said.